This chapter describes the cherry’s origins, botanical classification (taxonomy) and domestication of the only two species cultivated for food and industrial processing: sweet and sour cherry. Cherry breeding programs worldwide have focused on trees, fruit quality traits and resistance to biotic and abiotic factors as well as on specific local characteristics. A detailed discussion of breeding techniques (crossbreeding, early selection, seedling screening and field assessment, embryo culture and mutagenesis) follows. A section is dedicated to sour cherry breeding, whose problems differ from those of the sweet cherry. We underline the importance of the knowledge and conservation of genetic resources for their use in genomic approaches. Then, discuss breeding strategies and the new traits that have been introduced in new genotypes through genomics. Germplasm biodiversity is analyzed in its phylogenetic context. Then, the molecular breeding approaches are extensively described with particular attention for gene mapping and the development of marker linked to monogenic and polygenic traits. A section is dedicated to the gametophytic incompatibility of the sweet cherry, with an updated summary of the research conducted to identify the 57 incompatibility groups (the cultivars for each of these are reported). 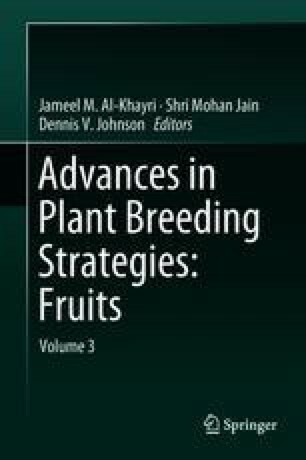 Finally, we take into account other aspects related to breeding in respect to how functional genes affect some fruit characteristics, the strategies used after the cherry genome was sequenced and the potential of genetic engineering. The Appendix provides pomological profiles of 44 of the most important innovative cultivars, according to the descriptive standard of the Brooks and Olmo official lists with each accompanied by original photos to aid in their identification. The authors thank Mrs. Clementina Forconi for her valuable assistance. List of the main sweet cherry varieties available for new orchards. The source of each profile is indicated by the number reported at the bottom as follow:  The Brooks & Olmo Register of Fruit & Nut Varieties. ASHS Press; October 1, 1997, 3rd ed. and Register of New Fruit and Nut Cultivars (List 34–48);  Reworked by Quero-Garcia J, Schuster M, Lopez-Ortega G, Charlot G (2017) Sweet cherry varieties and improvement. In: Quero-Garcia J, Iezzoni A, Pulawska J, Lang G (eds.) Cherries: botany, production and uses, 60–94. An asterisk following the variety name signifies “patented name” while ® signifies “registered trade mark name”.